George Looks Twice, center, and the grandchildren of Nicholas Black Elk stand before Bishop Robert Gruss and Deacon Marlon Leneaugh, director of Native Ministries, after presenting a petition requesting the diocese to nominate Black Elk for the cause for canonization. Hehani waste’, Cante wasteya nape ciuzapelo. Good morning, I greet you with a good heart and a warm handshake in the name of our Lord, Jesus Christ. My name is George Looks Twice, I am an enrolled member of the Oglala Lakota Nation and a member of Our Lady of the Sioux Parish in Oglala, South Dakota, where I was commissioned a Lay Minister for the Rapid City Diocese in 2009. I am the eldest of three grandsons and two granddaughters of the Oglala Holy Man, Chief, and Catechist Nicholas Black Elk. It is with great honor and privilege to be present on this historical day with my relatives, fellow tribal members, other native people, priests and lay ministers from across the diocese to present you with this petition. The petition contains over 1600 signatures from people of goodwill across the United States and Canada. The petition requests that the Diocese of Rapid City proceed as the petitioner to nominate Nicholas Black Elk, Sr. for the cause for canonization. Our grandfather, Nicholas, was born in 1866 into a lineage of great medicine men; and atop Hinhan Kaga, “The Making of Owls” (Harney Peak) Tunkasila (God) blessed him with a great vision, and his gifts were affirmed as he went on to became a recognized healer and respected medicine man at a very young age. Curious about Christianity, he began to watch and study. In 1885, he learned about Kateri Tekakwitha and signed the petition supporting the cause for her canonization. In 1904, he met a Jesuit priest who invited him to study Christianity at Holy Rosary Mission, near Pine Ridge, S.D. He did so, and on the feast of St. Nicholas, December 6, he was baptized Nicholas William. Saint Nicholas, appealed to him because he exhibited a model of Christian charity that resonated with grandpa’s role as a traditional spiritual leader and his own generosity in service to the Native People. Believing that Wakantanka, the Great Spirit, called him to greater service, he became a Christian and practiced his Lakota ways as well as the Catholic religion. He was comfortable praying with his pipe and his rosary and participated in Mass and Lakota ceremonies on a regular basis. In 1907 the Jesuits appointed him a catechist because of his love of Christ, his enthusiasm and excellent memory for learning scripture and Church teachings. Like St. Paul, he traveled widely to various reservations; preaching, sharing stories and teaching the Catholic faith with his “Two Roads Model” of catechism. He is attributed to having over 400 native people baptized, and since then his books and model lifestyle have inspired countless others in their spiritual journeys. He died in 1950 having lived an exemplary life of being faithful to Tunkasila and always wanting to serve the native people. There are many who are waiting to share the joy of the day when Nicholas Black Elk, Sr., will be counted among the company of saints by Holy Mother Church. We thank you bishop for this opportunity to make this presentation to you on behalf of the Black Elk family, our grandfather Nicholas and all the people of God who support this cause. In 2013 there was a television mini-series titled “The Bible” that aired on the History Channel. One of my favorite scenes is when Jesus says to Peter, “Let’s go fishing.” As they were in the boat conversing with one another and fishing, Jesus sticks his hand into the Sea of Galilee and begins to summon the fish. That day Peter and the other disciples netted a miraculous catch of fish. I thought of this story last summer when I was competing in Bishop Robert Gruss’ fishing tournament for seminarians. The fish were not biting so I decided to stick my hand into Lake Oahe and start summoning the fish. He smiled, but never stuck his hand in Lake Oahe to summon the fish. My team won; his did not. “I met my friend Brandon while working in the panhandle of Texas in 2013. He was half my age, a hard worker and eager to learn. As our working relationship grew, I learned that he was raised Catholic but was no longer practicing the faith. He was, at the time of this meeting, anti-Catholic; what I mean is he would say negative things about the Catholic faith and Christianity in general, and did not attend church of any kind. “There were two of us on that job who were active Catholics and we would travel an hour to Amarillo on Sundays to attend Mass at St. Mary Cathedral, followed by a trip to a shooting range and lunch. After a few weeks of talking to Brandon about shooting, he asked if he could come with; I told him we attend Mass before we go out to the range. That was okay with him, even though he had not been to Mass for quite a long time. “When that job was completed, Brandon returned to his home in Denver and we stayed in contact through email and an occasional phone call. I was working in Colorado in August 2015 and Brandon and I ended up going to a Rockies game one weekday afternoon. We had a great day and before we parted company, he told me that he wanted to go to confession but was scared. “He asked if I would help him get to confession. I said, ‘Sure!’ but I didn’t know when this could happen because the job I was working was ending that week and I knew I had no chance to do anything for him right then. “As Lent 2016 progressed, the promise I made to my friend stayed on my mind. I sent him a text a few weeks ago to see if he was still interested in the sacrament of confession and he said he was. I really wanted to help him get to confession before Holy Week so he could enjoy that liturgy and also be ready for Divine Mercy Sunday. Wow! That’s what I call fishing! This man drove all the way to Denver from the Black Hills to accompany someone to confession. What a gift of extraordinary generosity and an example of taking to heart Bishop Gruss’ invitation to accompany others in their journey to Christ. This joy-filled Easter season is a great time to apply Jesus’ words about fishing for people. Who is the one person — just one — you could help bring back to the church, to a deeper relationship with the Son of God? I look forward to hearing your fishing story at 605-716-5214 x235 or email MMcCormick@diorc.org. In last month’s West River Catholic I shared with you the vision statement that is very integral to the Pastoral Priority Plan as well has the three Pastoral Priorities. 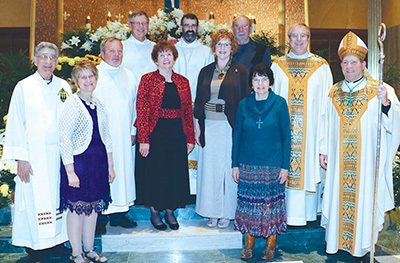 As you recall, the mission of the Diocese of Rapid City is aligned with the mission of the Roman Catholic Church extending from the mission of Jesus Christ and the Gospel. Our sacred mission statement provides the framework and focus for every ministry of the diocese. Our Priority Plan defines the efforts of the diocese for the next three to five years. Core values identified and illustrated in the Priority Plan are meant to guide the actions of every person, family, ministry and organization all across the diocese. The vision statement: Reconcile – Make Disciples – Live the Mission helps to provide the focus for the pastoral plan thereby making it more present the kingdom of God, in the diocese of Rapid City, for the next five years. The three Pastoral Priorities and the goals for each of them will become our focus for ministry over the next 18-24 months, guiding our efforts to build God’s kingdom through the year 2018. These priorities will inform the focus, clarity and direction of our ministry in support of the mission of the diocese. As you recall, the three Diocesan Pastoral Priorities include: Reconciliation, Forming Disciples, Funding the Mission. The goals for this priority include identifying areas where reconciliation and unity are strong and areas where reconciliation is needed and submitting to the bishop a plan which engages and promotes reconciliation and includes an implementation process. The goals for this priority include increasing the number of parishes which meet the criteria to be recognized as stewardship parishes and increasing the participation rate in formation events by at least twenty-five percent of the average number of parishioners currently attending Mass. Funding the Mission — Our Pastoral Plan lays out the vision and priorities for the Diocese of Rapid City. Our plan will be successful because disciples of Jesus Christ accept their call to joyfully and generously share their gifts so that the Gospel can be proclaimed and lived in western South Dakota. The goals for this priority include developing a Diocesan Facility Master Plan to include plans for a new chancery building and plans for the Terra Sancta campus, as well as implementing a financial plan to fund diocesan offices, ministries and facilities. The Priority Plan will also impact the foundational ministries of the diocese, those ministries which are part of the ongoing work of the local church. These foundational ministries and goals are as follows. 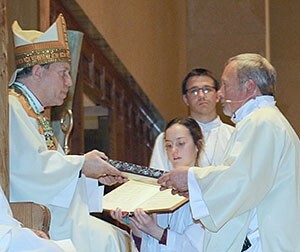 In the area of Sacraments and Worship, the main goals include chartering a liturgy commission under the direction of the Office of Worship to renew the liturgical life of the Diocese of Rapid City and to implement an evaluation process to measure each parishioner’s personal experience of the Mass in their parish. In the area of Education and Formation, the primary goals include providing three to five ongoing opportunities for formation for catechists and parishioners in a distance learning format and for directors of religious education to complete a certification program at the parish’s expense either through the VSI program or an approved equivalent. In the area of Governance and Finance, the primary goals are to provide at least two Parish Leadership education sessions in each deanery to assist parishes in operating within the diocesan and parish financial guidelines. A second goal is to implement a communication strategy that will support and enhance our foundational ministries. Finally, the goals in the area of Vocations and Evangelization include forming vocation committees in each parish to encourage and promote a culture of vocations, and forming 10-15 people from each parish in relational ministry and sharing the joy of the Gospel of Christ through witness and testimony. The complete Priority Plan of the Diocese of Rapid City can be found in the center section of this issue of the West River Catholic. Over the course of the next few months, this plan will be communicated in detail in various ways. 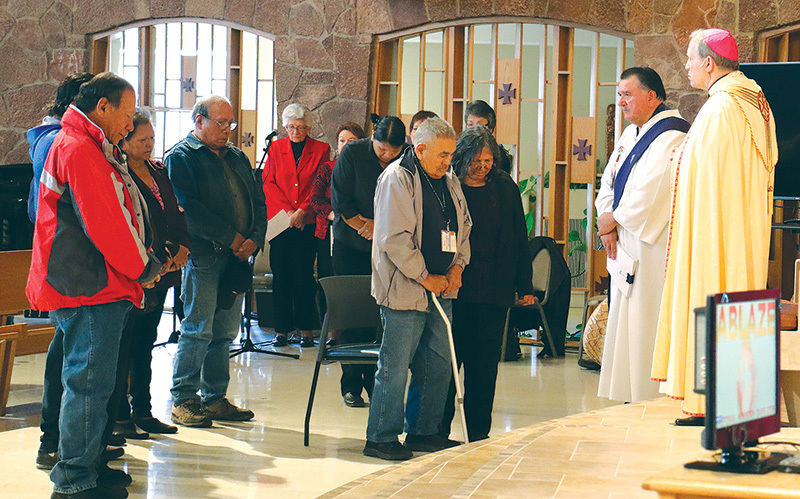 Besides the copy in the West River Catholic, it will be made available to everyone in the diocese with the great hopes that all embrace the vision – Reconcile – Make Disciples – Live the Mission. In doing so, I believe that the Lord will transform us as disciples, our families, our faith communities and our diocese. Please take the time to study, reflect upon and pray with this Priority Plan and begin to ask the Holy Spirit how you might be called to engage this vision in a personal way and as part of your parish community. Our plan will be successful because disciples of Jesus Christ accept their call to joyfully and generously share their gifts so that the Gospel can be proclaimed and lived in western South Dakota. May God continue to abundantly bless you, your family and the Diocese of Rapid City. Held at Smith Falls campground May 20-22, 2016. It will be a weekend of camping, canoeing, fellowship, and prayer. Limited space, first come first serve. Applications can be found online or obtained from Randy Vette – for more information contact rvette@diorce or 716-5214 ext 228. 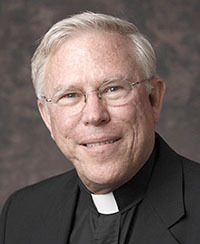 Father John Hatcher, SJ, has been nominated for Catholic Extensions Lune Christi Award. 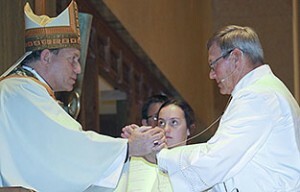 On March 31, Andy Clark, Lloyd Frein, and Craig Peterson were ordained permanent deacons at the Cathedral of Our Lady of Perpetual Help, Rapid City, by Bishop Robert Gruss. 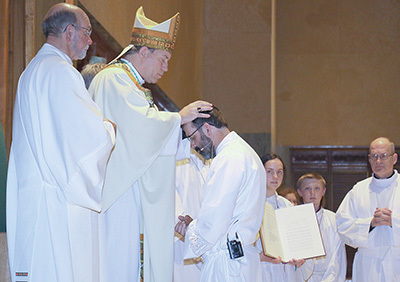 Did you miss the ordination? 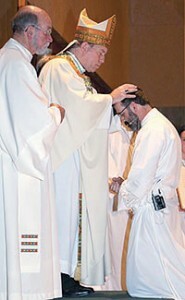 Click here or on a photo to see the Ordination Mass! Why did you decide to become a deacon? I became Catholic when I was 26 years old. The church has given me a lot over my lifetime, and I’ve felt the need for several decades to serve the church. I felt the tug for the first time when I chaperoned the trip to World Youth Day in Denver in 1993, but it wasn’t a good time then to start anything. I started the lay ministry program seven years ago and I realized this was something I could do. I felt called to do this, the doors opened and I went through them. What are you most excited about? People will know I’m a deacon and I hope they will come to me. I want to help people understand the church, why it does what it does. I am excited to be more involved with the church and talking to people about their faith and helping them through things. Eucharistic Minister, lector, acolyte, and has served on the parish council. Why did you decide to become a deacon? I feel called to a ministry being involved with the priests and the need there. Being called by God’s gift and grace. We are always called to more. What are you most excited about? Being involved with the church and my faith — we both lost our spouses and blended two families together. I really feel called to help with the grief process and families, to be there for the people and being able to pass on the gift of faith and the love of God that is so prevalent. I want to help share what the faith is and be with people on their journey. lector, sacristan, and in Knights of Columbus. Why did you decide to become a deacon: I don’t know that it was a decision to say yes, but I decided not to say no. I spent five years of silent prayer and discernment, and I finally went and found people who could help me discern it. I said, if this is what you want then I won’t say no. I left it in the hands of the many people who have prayed for me and God. What are you the most excited about? Doing whatever God wants me to do. I’ve always been someone who likes to serve. For many years I felt that was my excuse for not being that great at prayer. I am looking forward to more ministry to the homebound and the sick. It’s not my comfort zone. Margie and I have started doing some visits already. Father Kerry Prendiville has asked us to minister to a woman who recently passed away, and it wasn’t as scary as I thought. We found it to be rewarding.